Please click here to view plate five. This chapter, added by Francesco Carloni to Passerini’s book, continues Passerini’s work up to the present day. Passerini ended his history of the Guadagni family with Guadagno’s youth. Guadagno, son of Donato, was still living when Passerini wrote his book. Passerini lists Donato, Guadagno’s father, in the family tree but does not recall any detail of his life. Carloni starts the chapter with Donato’s life, continues with Guadagno’s life, the first part of which is taken from Passerini, and continues till our times (2011). Carloni had access to the memoirs of many of the twentieth century Guadagnis, met and talked to quite a few of them, and thus collected much material. This chapter is written in a concise way, to preserve Passerini’s style. In the appendix, at the end of the book, the chapter is rewritten more extensively, and contains most of the memoirs and personal souvenirs which Carloni gathered in his personal contacts with members of the family. Donato, son of Luigi, was born on August 11, 1794. His father died when he was still very young. The Guadagni patrimony was divided in two, half to Ottavia Guadagni Dufour Berte, the only child of Neri Guadagni, Donato’s cousin, and half to Donato. Through generosity and mismanagement of his fortune, over his long life, Donato lost most of his properties. Donato was a very devout and pleasant man. He led a calm and unassuming life. He died in 1879, at 85. Aurora, nicknamed Lolly, was Donato’s oldest child. After the death of her first husband, Count Alessandro Pejacsevich de Verocze, Austrian General and Governor of Trento, she married the very wealthy Belgian Baron Adriano Van der Linden d’Hoogwoorst. Adriano bought Palace Gianfigliazzi, in the heart of Florence, and restored it and furnished it luxuriously and with excellent taste. The palace was always full of Florentine and foreign nobles, artists, writers, and learned society. It was very fashionable for the society of the time to meet at the d’Hooghwoorst’s. Aurora and her husband were also good and charitable towards the poor. When Adriano died, all of Florence participated in tears at his funeral. A few years later, Aurora married for the third time. This time, she married Marquis Azzolino Malaspina di Fosdinovo, whose only sister married a cousin of Aurora, Giovanni Torrigiani. Aurora and Azzolino had no children. At Aurora’s death, Azzolino married Caterina Guadagni, nicknamed Mimma, daughter of Guadagno and niece of Aurora. Azzolino and Mimma had no children either. Azzolino had three brothers, but none of them had children. So the Malaspina fortune, with the beautiful castle of Fosdinovo, was inherited by Giovanni Torrigiani’s son, Carlo Filippo, whose mother, Azzolino’sister, was the last descendant of the Malaspina. Carlo Filippo was asked to add the surname Malaspina di Fosdinovo to his own, in order to be able to inherit. Thus, if we remember the enmity the Malaspinas had for Filippo, son of Bernardo Guadagni, in the 15th century, peace among the two families was now made. Moreover, a branch of the Guadagni, the Torrigiani, bore the Malaspina name and inherited their estate. Guadagno was born on October 1, 1833. In 1846, when he was thirteen, he was admitted among the pages of the court of Maximilian II, King of Bavaria. His parents sent him there because there was no military academy at that time in the Grand Duchy of Tuscany. His Majesty the King of Bavaria assigned him to the service of Queen Mary. In 1851, he passed the required examinations brilliantly and became a lieutenant of the Bavarian Artillery Corps. Four years later, the war against Russia broke out. Many Western European countries fought against Russia to protect the Turkish Empire from the Tsar’s aims. The Tsar wanted to enlarge the Russian Empire at Turkey’s expense. As Bavaria was not participating in the conflict, Guadagno took his leave from the Bavarian Army and volunteered to fight against Russia in the British Army (Let us remember that Guadagno’s mother, Lady Luisa Lee, was English, and her father was the British Viceroy of India. Italy did not exist as an independent nation yet. Italy was still divided into many small States, many of which were under Austrian or Spanish rule). He was accepted by the British as a Lieutenant. A short while later he was promoted Captain of the General Staff and Attache’ to General Stutterheim, Commander in Chief of all the Foreign Legions. After the war ended in 1856, Guadagno left the service and returned to Florence. However in 1859, the Second War of Independence broke out in Italy. The Italian patriots were fighting to gain independence from their Austrian rulers. Guadagno joined the Italian Army and was assigned to the General Staff of general Ulloa, Commander of the Tuscan Military Contingent. During the armistice of Villafranca, he became General Staff Commander of the Emilia Contingent. He had an important part in the organization of the Parma Brigade, which included the 49th and the 50th regiments. He commanded a squadron in the 49th regiment for some time. Meanwhile, the Emperor of Austria signed a peace treaty with the Italian Government, granting independence to part of the regions he held in Italy. However, Southern Italy was still a separate kingdom under the Bourbon monarchy. When in 1860 Garibaldi led an army of 1,000 volunteers to free Southern Italy from the Bourbons, Guadagno resigned from his commanding post and enthusiastically joined Garibaldi’s volunteers. He was part of the corps commanded by General Medici. While he was sailing for Sicily, with other volunteers, he was captured by an enemy frigate. For a month, he was detained in the fortress of Gaeta. As soon as he was freed, he went to Sicily and was appointed Major in the General Staff. He was given the command of the headquarters. Garibaldi assigned Guadagno many commissions, one of which was to organize the cavalry forces of the patriot army. In the famous battle of October 1st, at the head of 4 battalions, he was able to block the advance of the enemy army for nine hours, on the hills of Caserta, thus contributing to the Italian victory. At the end of the war, Guadagno married Luisa Barlow Hoy, a beautiful English woman, who lived in a villa near Naples. He abandoned his adventurous military life and returned happily to Masseto with his beloved wife. Masseto was an old Guadagni villa, surrounded by thousands of acres of property, located near Guadagni Hill, which Guadagno’s mother had saved from the dilapidation of the family’s fortune. Guadagno and Luisa had eight children and lived happily in Masseto during the winter months, and at La Traversa, a house up in the Apennine Mountains, in summer, for the rest of their lives. Guadagno spent his time educating his children, painting, hunting, and administering Masseto. He died in 1905, a few years after his wife. Guitto, son of Guadagno, was born on November 6, 1861. At his father’s death, he became Marquis of San Leolino. He loved trees, mostly fir trees. Every year, he planted many of them. He covered all the hills around Masseto with beautiful woods of fir trees. He spent his life in Masseto, taking care of his properties. He also had a mountain chalet at La Capannella, a ten acre estate on top of the Cucuzzolo mountain, half a mile from the Guadagni villa of La Traversa. He enjoyed spending every summer next to his brothers Luigi and then Bernardo, who in turn owned La Traversa. He died in 1941, at the age of 80, and was buried in Masseto. Giacomo was the son of Guadagno. He was born in Masseto, on April 22, 1866. Giacomo was the second of the boys and, as a tradition requires in the old noble families, he took up a military career. In 1882, he entered the military academy of Modena. In 1884, he became second-lieutenant and attended the “Scuola di Equitazione di Pinerolo” (Riding School of Pinerolo), which he finished in 1885. He was then assigned to the cavalry regiment of Padova. In 1890, he resigned from the military with the grade of lieutenant and dedicated himself to helping his father and his brother Guitto manage the family properties. He made great improvements in cattle breeding and in the arrangement of hilly lands. He was Municipal Magistrate in the city of Fiesole and candidate to the National Parliament. From 1918 to 1944, he supervised important farming companies in Tuscany and in Emilia. He died in Florence, on January 19, 1954. Bernardo, son of Guadagno, was born on February 11, 1869, in Pisa, where his parents were spending the winter months, which in Masseto were cold and humid. Bernardo had a delicate constitution, so he was not sent to a boarding school like his brothers. He was raised at Masseto. When he was ten, he decided he wanted to go to school. So he went to Florence and attended the Technical Institute. He lived with his grandmother Luisa, in the Guadagni Palace. When he was nineteen, Bernardo left for England. There he studied civil engineering by correspondence, and worked at the same time as assistant engineer in the Port of Cardiff. After he got his university degree, he took part in the planning and building of the first railroad between London and Cardiff, in Wales. Later, he moved to Lord Plymouth’s castle, where he lived for many years. There Bernardo was the superintendent of all the buildings on the property. 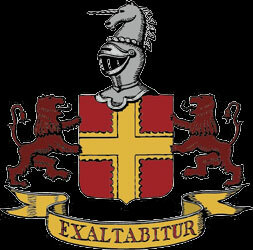 He lived there more as a friend of Lord Plymouth than as a dependent. When he was thirty, Bernardo got tired of living in England, and went to America. In New York there was a group of 50 civil engineers, of different nationalities, who were building railways. Bernardo introduced himself as a civil engineer. However, the head of the company told him that an English college degree had no value in the U.S.A. If he wanted, he could work as a janitor. So that is what Bernardo did. After three months, however, one day, one of the engineers was ill. The boss asked Bernardo to replace him. He had to make a very complicated drawing of a locomotive. He did such a good job that he was immediately promoted from janitor to civil engineer. With other engineers, Bernardo drew the first topographic map of Manhattan. He kept the blue-print of his project for many years. It was lost, after his death, during World War II. He also drew the project of Manhattan’s railway station. He drew the façade of the station like that of the Guadagni Palace in Florence. After three years, Bernardo was sent to Chicago. There they were building the first railroads. However, the hot and humid weather, and the long working hours, made him get an ulcer. The ulcer was also a consequence of canned food poisoning. Of the seven civil engineers of the company, he was the only survivor. In the meantime, Bernardo’s father, Guadagno, died in Florence. His mother had died a few years before. Even though Guitto inherited most of the fortune, because he was the eldest, Bernardo and the other brothers and sisters each inherited a small amount of money. So Bernardo went back to Italy, and bought himself a farm close to Firenzuola, in a little mountain valley ten miles from La Traversa. In 1908 he also designed and built a palace for himself in Firenzuola, in the Renaissance style. It is the most recent of the Guadagni palaces, beautiful and artistic like all of them. Jokingly he called it “Il Palasaccio” (“The ugly Palace”). Eventually, he became the mayor of Firenzuola. Bernardo married Madeleine Querqui, from Vendee’, France, whom he met at a winter resort in Switzerland. They had three daughters, Tecla, in 1908, Beatrice in 1910, and Isabella, in 1913. For many years they lived in Firenzuola, until they moved to Florence. However, they spent several months every year at La Traversa, which Bernardo bought from his nephew, Piero Guadagni. Madeleine realized that the girls of Firenzuola and surrounding valleys often went to work as maids in Florence. They would sometimes go when they were only thirteen, because of the great poverty in which their families lived. Hunger and malnutrition were widespread. It happened that several of these poor young girls would come back to their hometown with child. Their Florentine masters had abused them. Madeleine took pity on them and decided to do something about it. So she started to teach embroidery to these young girls. At that time, there was a great demand for finely embroidered table and bedroom linen. Bernardo was an artist, like many of the Guadagni. He would go to the Uffizi Gallery in Florence and draw sketches for the embroidery, inspired by the great masters of the Renaissance. He finished over 1,000 drawings. From them he would take the subjects for Madeleine’s works. Then Bernardo returned to England. He had his old friend and employer, Lord Plymouth, introduce him to the owner of “First Linen Stores”. The owner liked the Italian embroidered linen very much. He paid a good price for it and ordered more. He would keep two shop-windows full of them, all year long. At this point, Madeleine started an embroidery school, in Firenzuola. She hired some nuns from Monticelli as teachers. The nuns also taught Catholic Doctrine and Morals. Madeleine would buy the bleached linen from Belgium, and then have her girls work at it. Every time that one of her employees would get married, she would give her a whole piece of cloth. The profit she made by selling the embroidered linen in England, enabled her to pay the girls more than if they had gone to Florence as maids. Bernardo and Madeleine were very generous and helped many people. One of their peasants had a daughter who was born crippled. She had a dislocated hip. So Bernardo arranged for her to be operated on, at his own expense, by Doctor Stori, brother-in-law of Prince Corsini and well-known surgeon. Thus the poor peasant girl could walk, and work, and lead a happy life. As a maid, Bernardo and Madeleine hired a poor widow with three small children. They would pay for the kids’ boarding school, and keep them in their house during their vacation. They did many other good deeds, but did not talk about them. They were loved and esteemed by everyone in the valley. In 1925, Bernardo bought a piece of the garden of Palazzo Corsini, and built a house of thirty rooms for himself and his family on it. Bernardo died of tuberculosis when he was 72, at La Traversa. Madeleine, even though many years younger, survived him only for one year. The two were buried, side by side, in the little graveyard of La Traversa. Luigi, son of Guadagno, was born in 1879. He married Antonietta, only daughter of Marquis Revedin of San Martino. They had seven children: Luisa, Zato, Teresa, Antonio, Franco, Mary and Neri. After World War I, Italy was torn apart by Communist upheaval and Fascist counteraction. Some Guadagni started fighting the Communists. Luigi and Antonietta, however, were worried about their young children’s future. They saw that in Communist Russia, the nobles were the first to be killed by the Revolutionary forces. So they decided to leave Italy and migrate to the New World. Antonietta wanted to make sure her children were raised in Catholic surroundings. So they opted for French-speaking Canada. This decision had far-reaching consequences for the family history. As a result, now, most of the Guadagni live in America. Luigi bought an estate in the Province of Quebec and settled there with his family. However, life was not easy for the Guadagni family during their first years in Canada. The estate was not very productive. All the children had to work and help. However, the family managed to survive. Zato grew up to become a successful businessman and engineer. He built roads and dams all over the world. He earned and lost a fortune many times, but was always willing to pick himself up and start again. He died in Italy, wealthy and respected, a few years ago. Antonio’s life is recounted in a following chapter. Franco studied hard and became a prominent University Professor in Canada. Neri became a well known medical doctor and University professor in California. Luisa, Teresa and Mary married wealthy and successful husbands. Luigi died in 1943, his wife in 1959. Guadagno, son of Guitto, was born in 1899. He was the eldest son of Guitto, and became Marquis of San Leolino at his father’s death. He was raised in Masseto, with his three younger brothers. He interrupted his studies to fight in the Italian Army in World War I. At the end of the war, he did not want to resume his studies. He did not care much for the Communist upheaval. He fell in love with a young American girl, married her, and moved to America. After a few years, he divorced his first wife. They did not have any children. He married another American, called Elizabeth. They had a son, Charles Migliore, nicknamed Chuck, in 1941. Guadagno attended college in America, He worked as a curator of the Smithsonian Institute in Washington. He returned to Masseto with Elizabeth, for a few years. After Elizabeth’s death, Guadagno left the U.S.A., and returned to Masseto for good. He lived there as a gentleman-farmer until his death in 1979. Chuck, Guadagno’s son, came to Masseto for short periods of time. However, he was raised in the United States and spent most of his life there. He married Sally, and had a son, John. They live in Vermont. First Chuck was a fireman, later he became a truck driver. He is the actual Marquis of San Leolino, head of the Guadagni family. Guadagno’s brothers were named Migliore (Chuck was called after him), Vieri and Donato. Migliore died while climbing up a mountain in 1927. Vieri and Donato lived all their life in Masseto and took care of it. Vieri married twice but had no children. Donato died in 1984, Vieri a few years later. Vieri’s widow, Giuliana, and Chuck sold Masseto sometimes after the year 2005. Nobody was living in it any more. Masseto had been in the Guadagni Family for many centuries. It contained what was left of the prestigious Guadagni art collection and the Family Archives. “I feel like an orphan…” an American Guadagni told Francesco Carloni de Querqui, when he heard of the sale of Masseto. Adriano was Giacomo’s son. He was born in Florence, on February 18, 1916. He obtained a doctorate in engineering at the Politecnico of Milan University in July 1938. After he did his military service, he worked for 13 years in an electrical company in Florence. He took care of hydroelectric plants. After that, he worked for a company of Consulting Engineering in Milan. His activity involved projects for Greece and Brazil. In 1964, he started his own professional office. He was assigned the project of the new aqueduct for Florence and neighboring areas. He developed projects, mostly in the field of public utilities, in Italy (Venice, Tuscany and Emilia) as well as in Singapore, Nepal and Kuwait. Adriano died in Florence in 2007. He is survived by his wife Elisabetta Stavro Santarosa, and three children, Andrea, Marco and Marzia, all happily married, with children and grandchildren. Antonio, son of Luigi, was born in Florence, on June 11, 1911. He was raised in Florence. When his family moved to Canada, Antonio attended school in Quebec. After a few years, he moved to California, in the U.S.A. He did a variety of jobs: theatrical set designer, movie art director, engineer, skier, grape grower, citrus fruit rancher. He was also a good artist, and many of his paintings earned him recognition. When he was thirty-five, he married Dolores Mapelli, daughter of a successful wine and liquor wholesaler of Denver, Colorado. At this point, Antonio settled in Denver, and started working for his father-in-law, Guido Mapelli. In 1978, he was one of the nine men and women to receive the Encyclopedia Britannica Award for Achievement in Life. All but Antonio were chosen on the basis of a single achievement, be it painting, teaching, acting or something else. Antonio’s award, instead, was based on the many facets of a busy life. Antonio and Dolores have three children, Tecla, Vieri and Carlo. They are all married, with children and grand-children and they all live in Denver, Colorado, where they work in the family business. 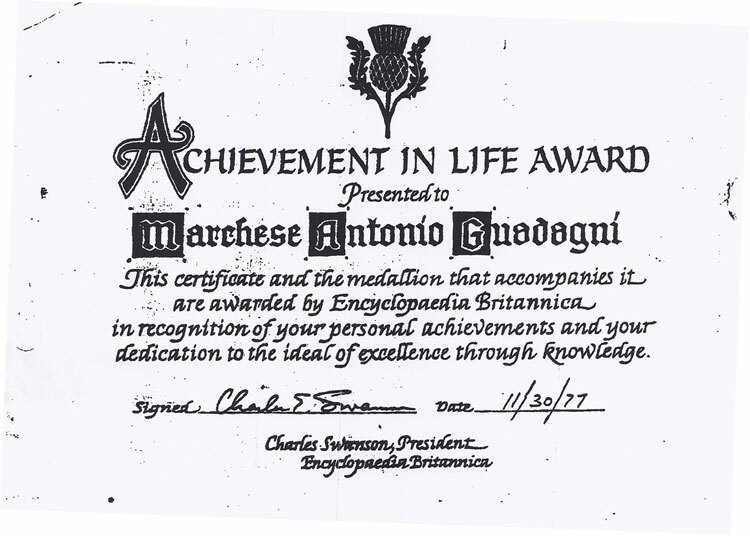 Copy of the Achievement in Life Award presented to Marchese (Marquis) Antonio Guadagni by the Encyclopedia Britannica. Vieri, son of Antonio, was born in Denver, Colorado, on June 12, 1948. He was raised in Denver, with his siblings. When he was eighteen, he went to Florence, Italy, for six months, to learn Italian and to learn about his Italian roots. When he returned to Denver, he started working in the family business. He did all kind of jobs, to learn all the facets of the business. When his uncle, Herman Mapelli, retired, Vieri became the President of the company. Under his tireless leadership, the company tripled in size and employees, and other companies were created. Vieri participates in the NHRA Drag Racing. 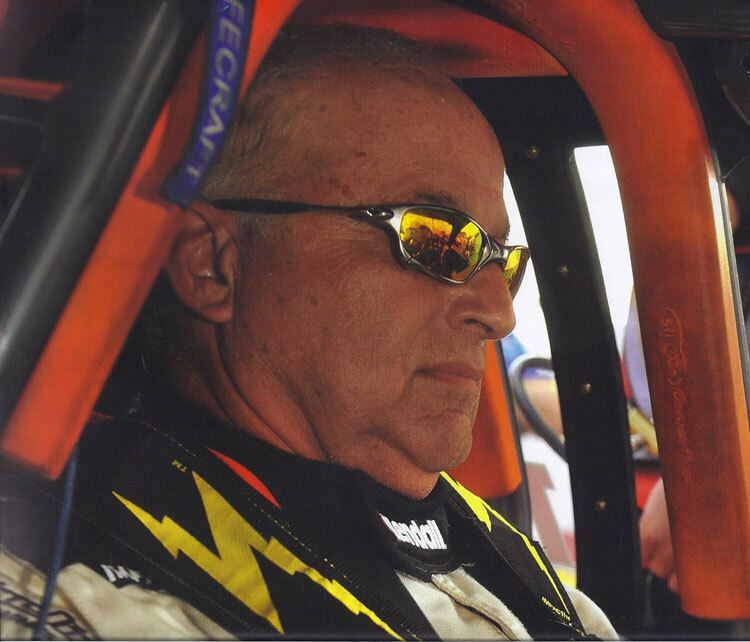 He is a team owner and driver, under the name V. Gaines. He often classifies among the first ten. Recently, in Florida, his car was the third quickest car in the Pro Stock category. Close-up of Vieri in his car. Vieri (V. Gaines) driving his car in the Pro-Stock competition. November 6, 1944 – February 29, 2016. Jill was born in Montreal, the first child of Frank and Audrey Guadagni. She was nicknamed Bunny by our dad and like him she embraced the vocation of teaching and like him she excelled at it. She received her own higher education at Loyola College and her professional training at St. Joseph’s Teachers’ College followed later in her teaching career by two Masters’ degrees from Concordia University. Jill’s subject was mathematics and an endless line of students stretching over fifty years have laid aside their lack of understanding or even downright hatred of the subject and have come to enjoy math in her classes at Dawson College in Montreal and later at Camosun College in Victoria, BC, from where she retired only last year. One colleague described her as ‘a teacher of teachers’ because of her influence on both fellow instructors and on students studying to become teachers. In 2009 Jill was nationally recognized for excellence in teaching at the annual ACCC (Association of Canadian Community Colleges) awards ceremony. She has authored several books that reflect her creative approach to teaching math with topics like tessellations and the art of M.C. Escher, many geared to Middle School Teachers. Equal to Jill’s love of teaching was her love of her husband of 40 years, Walter Britton who passed away two years ago. They were great companions and their love of travelling took them to New Zealand and Australia, China, Japan, the British Isles and Europe. Despite her worsening health issues, Jill soldiered on and made family centered trips to NYC and New Zealand this past fall. Jill instilled a real love of theatre and film in her siblings growing up who in turn passed it on to their own children. She is survived by her brother Don (Pam) and sisters Sandy (Allan) and Nicky (Robin), her seven nieces and nephews, Matthew and Emma Guadagni, Mike and Donny Kitson and Griffin, Tess and Charlie Benger, as well as many cousins. She was predeceased by her husband Walter (2013) and her parents, Professor Frank Guadagni (1964) and Audrey Brisbane (2014) and stepfather William Brisbane (2003). In keeping with Jill’s wishes, there will be no memorial service after cremation. Her teaching legacy will survive her for many years to come. Jill has established an education fund at Camosun College. Please direct donations to the Camosun Foundation, Jill Britton Elementary Education Mathematics Award. To everyone else, she is Jill but to us, friends and family, she will always be Bunny. Mom told me that she was given this nickname by our Dad when she was a baby because she used to twitch her nose like a rabbit and he was so taken with the facial antics of his first child that she was Bunny ever after.